Well there's something I never thought I'd say! Me, wearing something designed by the same man that designed Princess Diana's wedding dress! Last month I was approached by a PR company to review a product that would remain a secret until I received it. They asked for my clothing and shoe sizes and my address so that they could send me out a mystery package - and that was all I knew about it until said parcel arrived on my door mat! 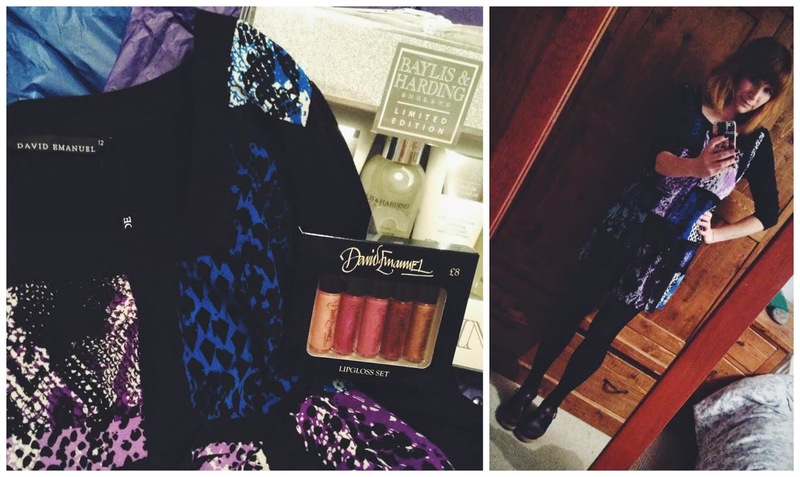 Turns out this campaign was for David Emanuel's new range for Bon Marché, and I was sent this snake print tunic, together with some pampering goodies to try out. I have to confess I feel that this brand is aimed at women a little older than me, but I styled the tunic in my own way and wore it to the pub anyway! I actually thought it was a dress and not a tunic top, so only wore it with tights and clogs - oops! But it's 32 inches long so not too indecent, although I probably woudn't wear it out like that in daylight. I liked the square neck and three quarter length sleeves, and also thought the jersey material it was made from was of very good quality but, as I said before, I do think this is probably aimed at either older, or more sensible women. I'm a bit of a hippy at heart and prefer to wear bright colours and vintage.